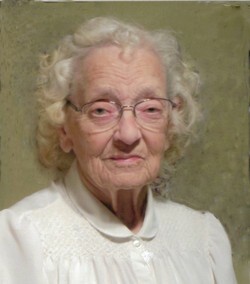 Pearl Ruth (Shafer) DeBardeleben was born July 2, 1923 in Hill City, MN. to Daniel and Marguerite Shafer. She was the youngest of four siblings – Dan, Geneva, Munroe (Dusty) and Dorthy. She lived most of her childhood in Wisconsin, mostly in Barron County, attending both country and town schools. Her family was poor but she always said she didn’t notice because many other families were in similar situations. She mostly spoke of her childhood in positive ways. Pearl was united in marriage to her high school sweetheart, John Lloyd DeBardeleben, on April 5, 1943 (Easter Sunday) in Waukegan, Illinois. She loved to tell the story about how they met...after attending her first three years of high school in Spooner, she was very disappointed when her father decided to move to Phillips. She soon learned that God had a plan when she and dad met the first day of their senior year. Though they came from two different backgrounds they were a perfect match for each other! Pearl lived graciously alone for 36 years after John’s untimely death in an automobile accident in 1983, still considering herself very much married to her soulmate and missing him every day. Pearl spent the first 25 years of her married life as an Air Force wife. She loved that life and lived in many different places…Michigan, New Hampshire, Florida, Illinois, South Dakota, England and Germany to name a few. After John retired from the Air Force they moved to southern Illinois until moving back to the Spooner area in 1979. Pearl wintered in Phoenix for a few years in the early 1990’s. Before having children Pearl enjoyed jobs such working in an ice cream factory, binocular factory and at Abbots Lab. Later she sold real estate for a time and loved teaching at the Christian Academy at Spooner Wesleyan for several years after moving back to Wisconsin. Mostly Pearl was an amazing wife and mother to 45 foster babies (sometimes having 2 or 3 at a time) and five children, adopted in Wisconsin, Germany and Illinois. She had a gift and love for caring for babies and it was one of the greatest joys of her life! Pearl had many interests, skills and hobbies. She loved playing and working in the great outdoors (Which explains why her favorite places she lived were the country side of England, the woods of New Hampshire, the Black Hills and northern Wisconsin.) She was handy with tools…she built things, did remodeling in her homes including tile work, built retaining walls, a drainage system around her house and countless other projects. She collected rocks, dolls and stuffed animals. She was an accomplished seamstress as well as knitting and crocheting, countless crafts, drawing, painting and writing poetry. Pearl enjoyed helping people feel better using reflexology. She was still riding her John Deere mower, hauling rocks around, shoveling her driveway and cutting branches with a power saw at the age of 92! Pearl truly enjoyed serving on the board of directors for Venture’s Unlimited for 17 years until her retirement December 2013. Most important in Pearl’s life were her relationships with God and her family. She often said, “It’s been a wonderful life”. When she first began her Alzheimer’s journey in June 2015 she told her children she was ready to die and go to heaven…we always knew God had a plan and now that has been fulfilled. Pearl’s children have been blessed to have the best mother in the world…James (Jed) DeBardeleben (Shelley) – St. Louis, MO., Gretchen Ritter (Larry) – Sioux Falls, SD, Theresa (Tracy) Drury (Mike) – Phoenix, AZ, Thomas (Tom) DeBardeleben (Cathy) – Phoenix, AZ, and Tabitha (Tabby) – Shell Lake, Wisconsin. Pearl will also be missed and will be held in the hearts of her grandchildren: Jason, Cory, Heath, Martin, Jaime, Tommy, Tyler, Tiffany, Talia, Sara Pearl and Dylan. As well as many great grandchildren, great great grandchildren, nieces, nephews, other extended family and friends. Memorials in her honor may be directed to Ventures Unlimited, Alzheimer’s Day Respite Program Washburn County or the Wisconsin Alzheimer’s Disease Research Center. Visitation for Pearl will be Friday, January 25th from 5:00 to 8:00 PM at the Spooner Funeral Home. Her funeral service will be Saturday, January 26th at 11:00 AM at Spooner Wesleyan Church with a luncheon to follow. Officiating will be Pastor LeRoy Drake and pall bearers will be Tommy DeBardeleben, Talia Coyne, Tyler Debardeleben, Tiffany Swartz, Sara Pearl Drury, Dylan Drury, and Heath DeBardeleben. Visitation will be for one hour prior to the service. Internment will be in the Shell Lake Cemetery. Visitation one hour prior to the service.